If you've been following me on Instagram, you'll know that I've been making a work bag for Amanda, who runs the admin and organisation side of Sewing Patterns by Mrs H. She's also my sister, and I can get away with poking fun at her love of organisation, whilst also benefiting from her love of organisation! 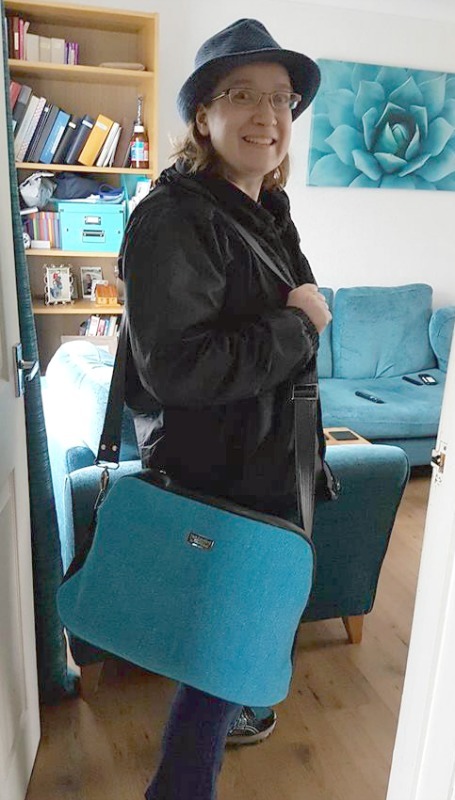 I never thought I'd be able to make her a bag, she's a 'large black backpack' kinda gal, and has been happy with only one bag for pretty much ...urm... ever? 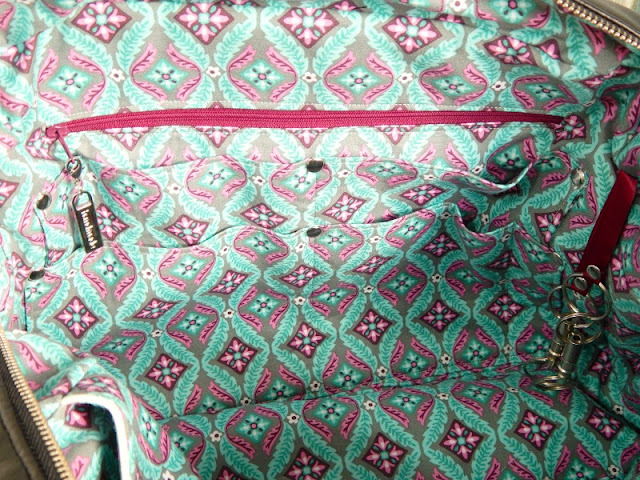 So when she said she felt she 'needed' a work bag, something befitting the office manager of a pattern design company, I leapt into action! 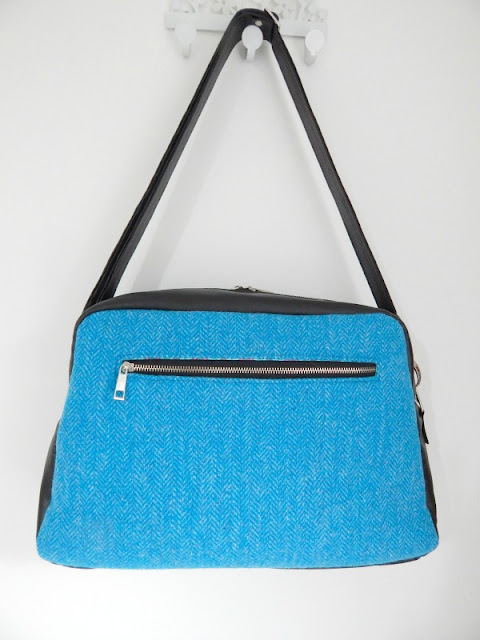 She has been heavily influenced by the beautiful bags being shown in a British Bag making group on Facebook which quite often feature Harris Tweed, and with the help of my friend Judy from Hobo Bunny, we sourced some turquoise herringbone Harris Tweed. 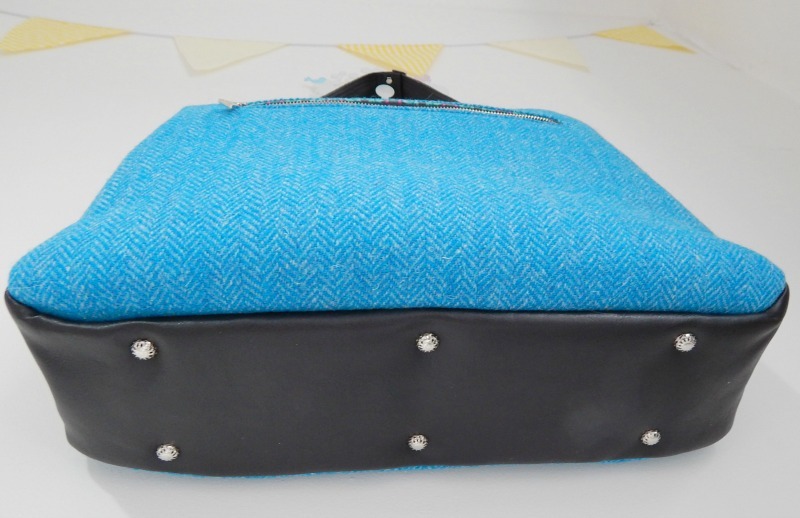 As Amanda will be using her bag to represent my business, it was essential that we used a bag pattern that I have written (obviously), so we chose the Nappy Bag. We left off the exterior pockets and the short handles to make the most of the tweed, plus Amanda was confident she would never use the shoulder handles, only the cross body strap...or as she calls it, the "Over the Head strap"
I used a #5 metal zip with black tape, and added double pulls to it. I bought it as continuous zipper, and was taught how to use these by Liz from Moments. When I forget, I just watch this YouTube video to remind myself how to add the pulls! I added silver metal cage feet to the bottom of the bag to try to protect the base, I know Amanda will be fairly rough on this bag! I bought my feet from 3DAN on Etsy. I didn't want to stitch over the metal teeth when finishing the gusset, so I used rivets in it's place, and made sure they were double cap as they would be seen on the lining as well as the outer. To secure the triangular rings for the strap I stitched, then added two rivets to secure it in place. Although the strap won't be removed, I still made it removable for added bling! The back of the bag features a large zip pocket, using the same metal zip as for the main gusset compartment. Inside the zip pocket is a second zip pocket. 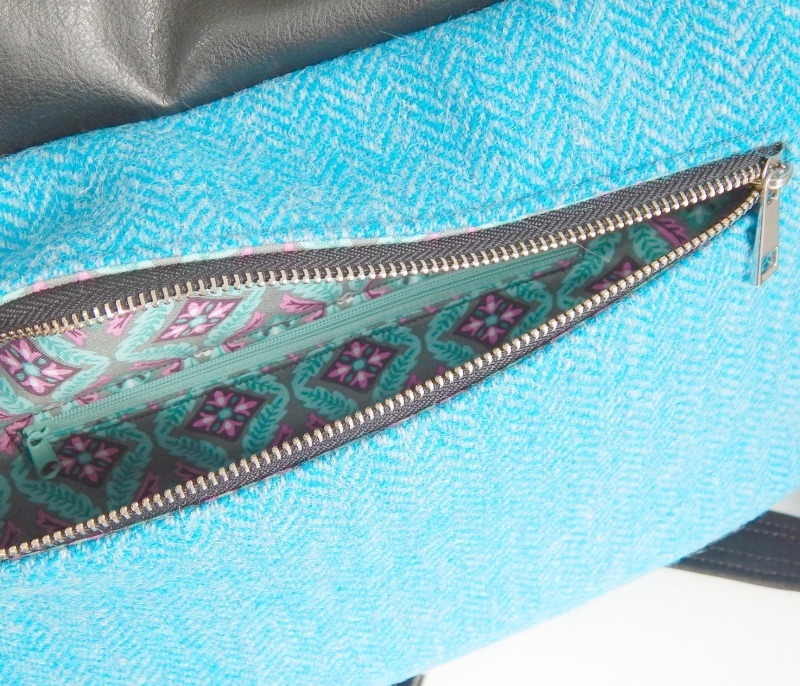 You can find my tutorial for adding a double zip pocket here. 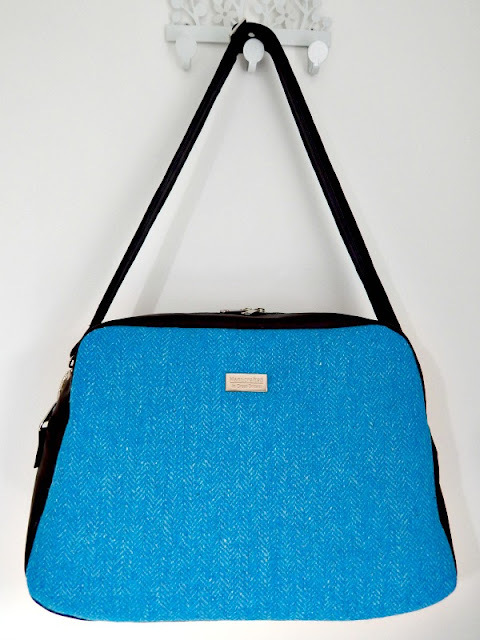 The front panel of the bag just has a 'Handcrafted in Great Britain' label from Emmaline Bags. 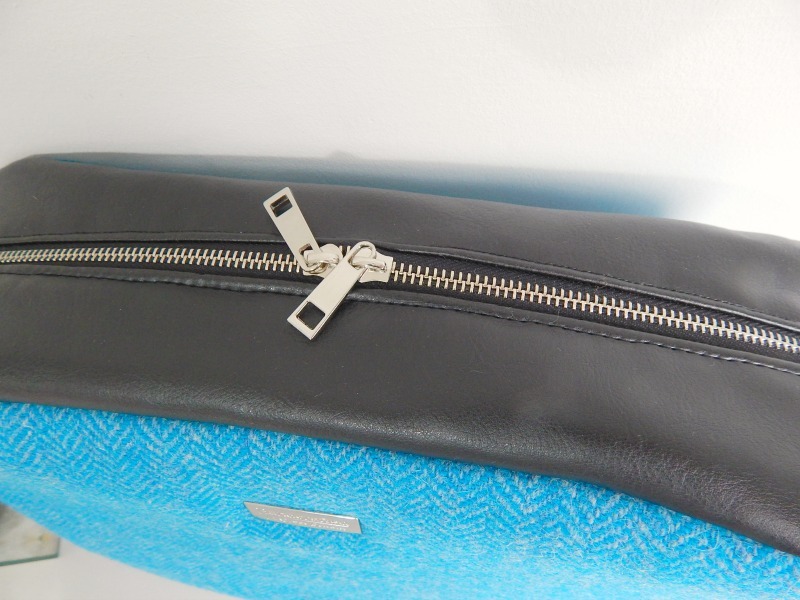 I used Scotch Guard on the Harris Tweed before cutting into it, so that I didn't damage any of the faux leather or hardware with the spray. 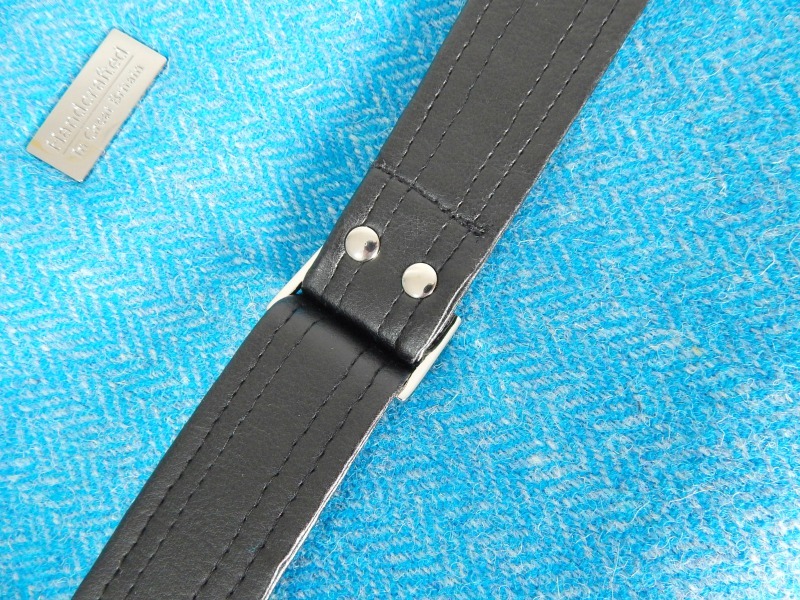 I used rivets as well as stitching to secure the strap, just to be double sure! 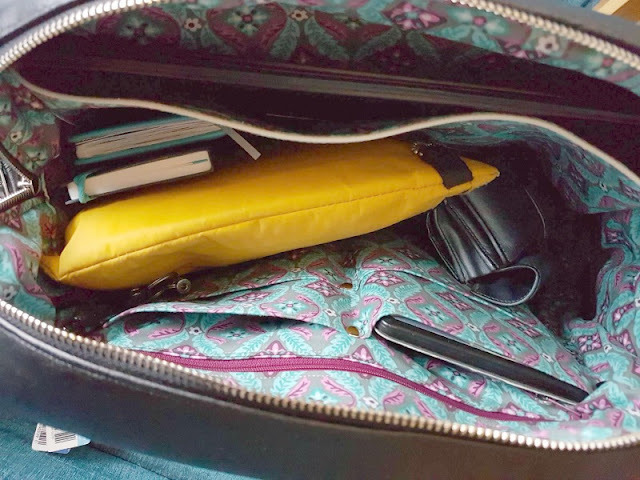 Inside the bag is another double zip pocket and 4 slip pockets, plus one pen pocket on the edge of the slip pockets. I used rivets to reinforce the slip pockets...again because I know how much use this bag will see! 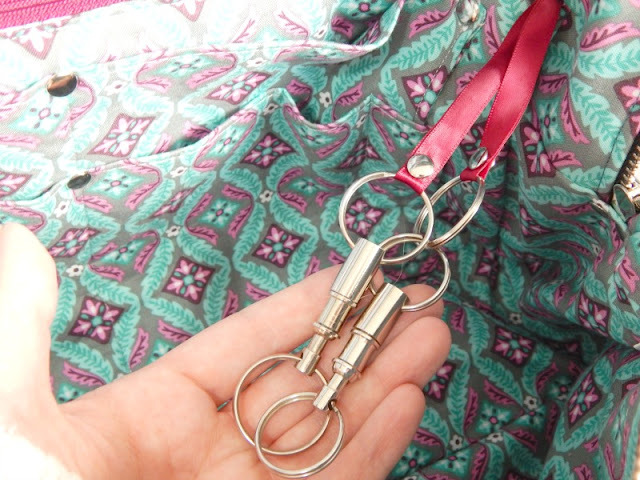 If you want to use rivets to reinforce your slip pockets, you can find my tutorial here. I also added two quick release key fobs to the lining using ribbon and 6mm double cap rivets. I know, I obviously do like my new rivet press! I bought the key fobs on eBay. I bought my rivet press from Green Grizzly. The rivets are from Emmaline Bags. 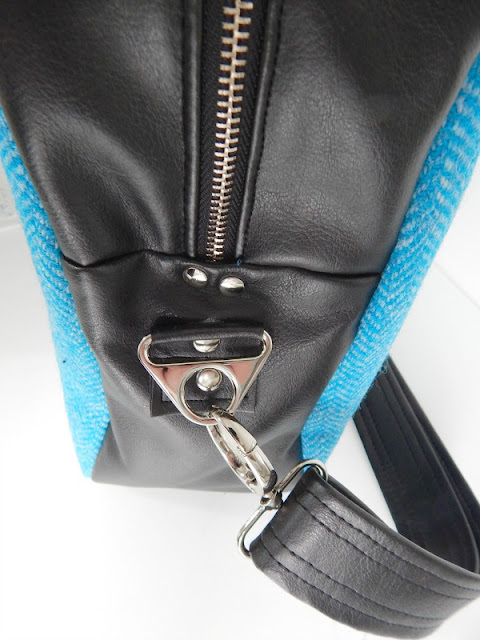 I added a strip of black thick elastic to the lining gusset to hold a water bottle. Amanda abhors anything remotely looking like a frill, so I couldn't add my usual water bottle holder made from elastic in a cotton tube, it was too frilly looking, so this was a great option. 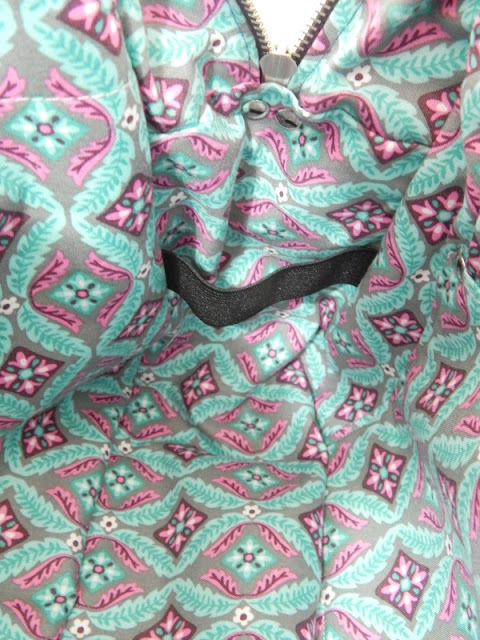 On the other side of the lining from the slip and zip pockets is a full width clipboard pocket. I used Invisible magnetic snaps to hold this in place when the clipboard isn't in it so that there's nothing to catch on important paperwork. We didn't make any modifications to the size or shape of the original Nappy Bag pattern, just pimped it a little! Amanda found the back pocket so generous she was able to fit her book in it as well as a myriad of other bits and pieces! 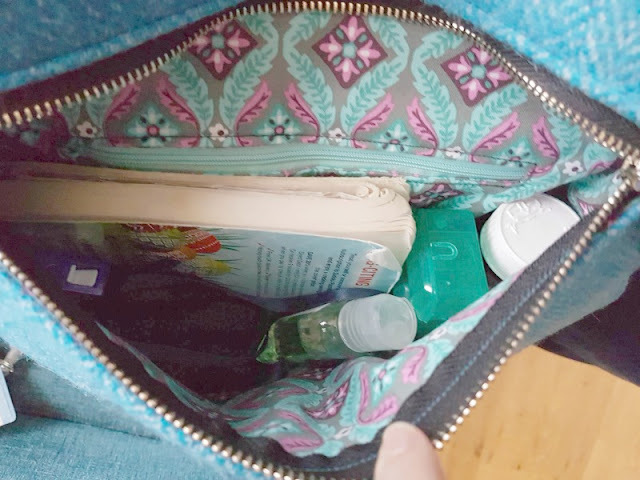 She loaded up the middle pocket for a full day's work too including her medication pouch (inhalers etc), clipboard, diary, notebook, purse, clipboard etc! 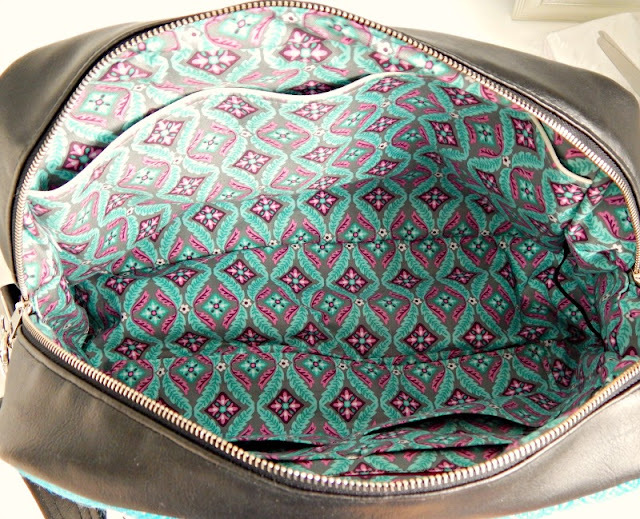 The great thing about it is that the pockets all being on the inside, the shape of the bag didn't change!